I believe the homeowners harvest the best apples from the Spur types, especially in the warm/hot Central Valley climates and hot Arizona, New Mexico, and Texas areas which have the winter chill hours. Most well known apples do not do well in our hot climates but Spur types will because of how the foliage protects the fruit on the inner spur wood. 1. They are compact growers. 2. They set quantities of good quality apples on short spurs on the main limbs and trunks. They do not weight down the limbs and the fruit is protected by the outer limbs and foliage. We had Crimson and Yellow Spur trees near the house and we had large quality apples that did not produce on most standard trees in our heat. 3. We have 6 Spur varieties in our orchards, but only list three because we have failed to sell them where needed. Crimson and Yellow are similar in eating quality to Red and Yellow Delicious apples. Granny Smith Spur sets very heavily with very good apples, more than a family can easily use. My wife and I have not eaten an Arkansas Black from a standard tree but many from the Spur trees. I also like Bisbee Spur which sets a good crop of tasty apples every year. Visalia is not apple climate but my wife makes quantities of applesauce each summer for our winter fruit for breakfast when out of bananas and citrus. I am fond of warm applesauce on a cold January morning. GRANNY SMITH SPUR came from eastern Washington. We planted in our orchard 2/21/91. When the fruit drops, the ground is all green and still lots of good fruit on the trees. This selection sets a very heavy crop of quality apples with what seems like thousands per one tree. Large, skin displays slight striping on green. Flesh is firm, sweet/tart. The apple is good as fresh fruit, cooking, and sauce. Ripens September – October. 400 hours chilling but does well in cold climates. RED DELICIOUS (CRIMSON) SPUR looks like a lighter colored Red Delicious. This selection is large with good flavor and better than the varieties in the stores today. The variety was brought from Canada in 1968 so not one of today’s tasteless apples. The fruit is large with red waxy skin, firm white crisp and juicy flesh with good flavor. The fruit ripens September – October and needs 800 chilling hours. YELLOW DELICIOUS (Yelo) SPUR is similar in appearance and taste to the old, very popular Yellow Delicious apple. This selection was brought from Canada in 1967. It is a large Golden Delicious with crisp firm delicious flesh. Ripens September – October and needs 600 chilling hours. 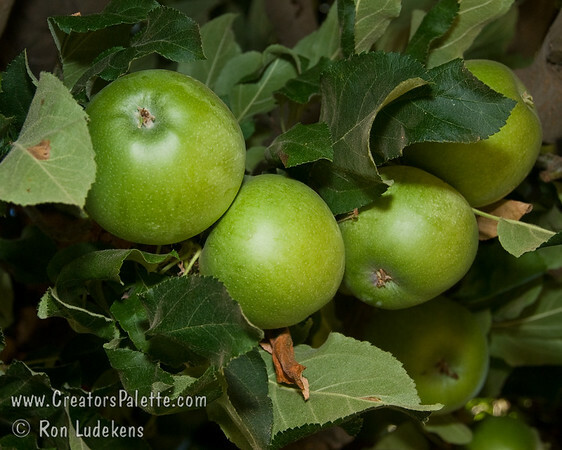 Ron's note 9/14/16: Currently we are only growing the Granny Smith Spur Apple - and it is an all around favorite. Seems the popularity of the Red and Yellow Delicious Apples (and of course the lesser known spur selections) are waning as so many other great apples are on the market. Earlier I wrote about the Massively Fruiting Granny Smith Spur Apple. Today I get to show the real benefits of this tree. Granny Smith Apples are not only great for fresh eating - they are excellent for making pies. The apple peeler is a life saver - more pies for less work! The best part of my job is eating the desserts. The hardest part is going to the gym later. Seconds anyone? I have got to show you this tree! It fruits like crazy! Perfect, juicy, tangy, Granny Smith Apples. Look at how loaded it is. And you have to remember that this tree had most of its wood cut off each year to produce vegetative growth for the annual budding needs. This tree is a perfect example of what a Spur Apple does. In our hot valley, we rarely get apples that taste good after the long hot summer. If it fruits in the fall season, most apples are not good through our summer heat. But Spur Apples are different. Spur apples produce fruit on the inside of the tree - well shaded from the blistering sun. Spur Apple trees are also smaller growers making it much easier to reach fruit at harvest time. The apples are not smaller - just the tree. Spur Apple trees are naturally semi-dwarf which is why you find them on Common Apple rootstock instead of semi-dwarfing rootstock. If you look at our recommended variety lists for California's Central Valley and other hot summer areas with appropriate chilling, you will find Spur Apples at the top of the list. Just in time for Halloween and fall festival pies. Yumm.